Good morning, here is your Sunday Patriots news 12-23, & AFC East Notes. From all of us here, we wish you all an early very Merry Christmas. Did you Know? That the Patriots currently have a regular season home winning streak of 11 games dating back to last season. That is currently the fifth longest in team history and can move into a 4th place tie with the team from 2006-2008. Did you Know Pt.2? The Patriots picked up Cordarrelle Patterson to help with the kickoff return game. The Patriots currently rank 2nd in the league with a 28.6 yards per return average. If that number remains the same or increases, it will be the team’s best average in the Bill Belichick era, beating the 2006 team’s average of 26.8 yards per return. Did you Know Pt. 3: With just 21 yards passing today, Tom Brady will reach the 4000-yard mark for the 10th time in his career, the 3rd most in NFL history. 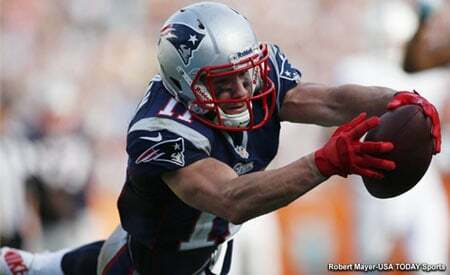 Also with just three catches, Julian Edelman will move past Ben Coates (490) in career catches with the team, which will put him in 5th place. Points Allowed Stats: One of the more interesting stats especially for those who like to chime in with the “Bill can’t coach defense anymore” crowd is the fact that since 2001 the Patriots have the most seasons allowing 20 points per game or fewer with 12. The Ravens and Steelers are next with 11 each. Baltimore is a shoo-in for their 12th this season unless they allow 68 points in their last two games, which isn’t likely. The Patriots would have to hold the Bills and Jets combined for 10 points…very unlikely. The Steelers would have to hold their opponents (New Orleans today) to four points or less. With the news this week after Josh Gordon announced that he was stepping away from football to concentrate on his own mental health and addiction issues and the league announced that he failed another drug test, the social media world exploded. Several noted hot take media types including a few here in the Boston market took to calling Gordon “selfish” and not taking “individual or personal responsibility” is short-sighted and wrong. We were guilty of it here as well, not being aware of how deep his mental health issues were initially until the team signed him. And mental health and addiction issues DO go hand-in-hand. I keep reading and hearing people go on and on about “choices” which is patently ludicrous. Does anyone seriously think that a person with their first drink or taste of an illegal substance plan on becoming an alcoholic or drug addict? Chris Carter who had his own issues with addiction during his playing career was very emotional about the entire Gordon issue and how he feels most people still don’t understand it all. “And the kid needs help! He does not need football. He needs help. He needs tools that he can be able to say ‘no.’ No to those drugs. No to the world, and yes to his opportunities. Yes to relationships. The Patriots, who are now being roasted by the “I told you so” crowd, certainly knew the risks with signing a player with a troubled history such as Gordon’s. They did everything they could as an organization to help him find his way here. They installed him with a locker right next to Tom Brady’s where the two would certainly interact more. The coaches stayed late with him, helping him learn the offense and navigate the intricacies of it. Even the PR Dept. of Stacey James took great care with his interactions with the media, trying to keep everything on point and limit the talk about the off-field distractions that had derailed such a promising career. There were even rumors to the effect that the team had hired people to hang with Gordon in the off-hours to keep him away from the demons that have haunted him. Not like Foxboro on a Friday night will be confused with Vegas. But even that, wasn’t enough for a person/addict with issues to fall back into their destructive behavior. For the first time in his professional career, Gordon was playing for a winner with a chance to write his own redemption story. That’s the saddest part of the story. I would encourage anyone to attend an Alcoholic’s Anonymous or Narcotics Anonymous meeting sometime and listen to the stories of those who tried and failed many, many times before finally slipping away from the bonds of their demons. Rarely if ever it is done on the first attempt. The Patriots issues at wide receiver are minuscule next to a man’s life. We hope that Gordon, the man, will find his way back to mental health and be able to live his life as normally as possible. Whether or not he ever gets another chance to play in the NFL is secondary at this point. When the Patriots signed OLB Kamalu to their practice squad on November 5th, it barely registered on the social media spectrum, other than his unusual name. But what is really intriguing about Kamalu, who has been signed to the active roster in the fallout from the Josh Gordon situation is his size and athleticism. Kamalu originally was an UDFA from Miami and signed with the Houston Texans in 2016. He’s 6’6 and weighs 295 pounds, but for a big man, he’s pretty athletic. Kamalu ran a 4.88 in the 40-yard dash, a 31.5-inch vertical leap, 7.32-second 3-cone drill, and a 4.58-second short shuttle at his pro day. In his time with the Texans, they used him at OLB and in 13 games with three starts, he logged 11 tackles and three sacks before being let go in the final cutdown this year. He briefly spent time with the Cardinals on their practice squad before signing with the Pats. Now he’s on the active roster and although Bill Belichick had been wondering how the Pats would use him, maybe this week and next against the Jets, he’ll see some snaps and we’ll catch a glimpse of what he can do. Belichick was asked by NESN’s Doug Kyed a few weeks ago how the team envisioned Kamalu. “I think we’re trying to figure it out, but he’s an interesting player to work with and a good player to work with,” Belichick said. “He works hard, smart. He’s played outside linebacker to defensive end to defensive tackle. So, he hasn’t really done a lot in our defense. It’s been more scout team and so forth, drills. With Kamalu’s size, he won’t be an OLB with the Patriots but probably a DE or kick into the interior on passing downs. If he is active today, that would mean he’s leapfrogged both Derek Rivers and Keionta Davis on the depth chart as both have been inactive lately. But it is also said that Belichick remembers when opponents have big games against them. Well in a 2017 preseason game, Kamalu had four tackles, a sack and two QB hits against the Patriots. On a defense that could really use some help in the front seven, perhaps Kamalu could work himself into a job beginning today. The most overlooked aspect of the Patriots this season has been the play of their secondary. Which overall this season has been very good. The team has their best corner, Stephon Gilmore playing at a high level, he’s been outstanding from the first snaps during OTAs and has continued that. Even though the team lost Eric Rowe to IR, they’ve scarcely missed a beat with Jason McCourty, Jonathan Jones, and rookie J.C.Jackson holding down the cornerback position. They have been playing so well that this year’s 2nd round draft pick Duke Dawson who was injured for most of the first half of the season, hasn’t even played yet. Jackson, the UDFA from Maryland has been terrific so far as he’s making his presence felt in the 2nd half of the season. At safety, the team still has Devin McCourty and Pat Chung along with the “closer” Duron Harmon and then the team added former 2nd round draft pick Obi Melifonwu. That’s a deep area as well. Ah, you say, but what about the yards allowed. The Patriots allow 256 yards thru the air each week, only 23rd in the league. But opposing QBs are still not very efficient when facing the Pats secondary. They currently rank 9th in the league in opposing QB rating with an 88.5 mark. Jackson leads the way (albeit in a limited body of work) with opposing QBs having a rating of just 26.0 when targeting him. Gilmore has an outstanding 60.1 rating, frequently covering the opposition’s top WR. Jonathan Jones who plays the very tough position in the slot where a WR can go in either direction has a rating of 79.5 when being targeted. McCourty brings up the rear with a 98.8 but has played tough all year. The Buffalo Bills are smelling blood in the water this week as absurd as that sounds for a team that is 3-29 against Tom Brady. All of the talk out of Western New York this week centers around “3”. Can the Bills make it three in a row that the Patriots lose? With their offense improving but still among the worst in the league, Buffalo will have to rely on their defense, including their top-ranked pass defense to keep the score close and give Josh Allen and the offense the opportunity to steal one on the road. They’ll not only need a big game from their secondary but from the big guy Kyle Williams inside. Buffalo hasn’t got a sack in their last two games but they’ll need Williams to bring pressure inside where Brady can’t step into his throws. If they can do that, they’ll have a puncher’s chance, as they did in October. The Miami Dolphins are 7-7 and still in the playoff hunt but to get there they are going to need some help. But the ownership will be looking hard at once again making some changes at the end of the season and that begins with Executive VP of Football Operations Mike Tannenbaum and GM Chris Grier. Tannenbaum has been at the helm for the Dolphins for the past four years and the franchise is no better or worse than they were when he took over. Is this the end for him? Very possibly. And he may not be alone. Head Coach Adam Gase, like his team, has been very inconsistent. These next two games may hold a lot of the future for these two. An 8-8 finish might be the end for the both of them. The once proud Dolphin franchise is 199-1949 since the 1994 season. The Patriots in the same time frame in the regular season are 277-121. Plus they are 30-14 in the post-season. Since Gase has taken over, the mediocrity has continued with a 23-23 mark. Those numbers would both be under .500 if not for a “miracle” finish. The New York Jets 2018 season is over as far as any hopes for a playoff berth are, however, there is an awful lot to play for in the next two weeks against the Packers and then next week at the Patriots. And it isn’t just for pride and jobs in 2019. It is hope. The Jets are looking for a sign that their fortunes are headed in the right direction. After two decades of having the Patriots dominate the division, the Jets invested heavily in QB Sam Darnold. Any rookie QB starting in the NFL is going to struggle at times and Darnold was no exception. But he played his best game of the year last week against the #2 seed in the AFC, the Houston Texans and the Jets came up just short of upsetting Houston. Now Darnold gets to take on two of the best QBs of this generation. Aaron Rodgers this week and Tom Brady in the finale in Foxboro. This will be a huge opportunity for the Jets and Darnold to build some momentum for 2019. 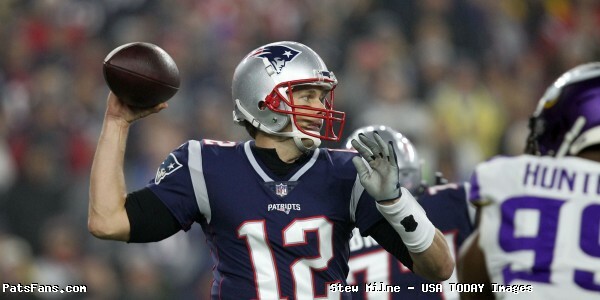 This entry was posted in 2018 Patriots Regular Season, NFL Commentary, NFL News, Patriots Commentary, Patriots News and tagged Bill Belichick, Buffalo Bills, Devin McCourty, Duron Harmon, James White, Jason McCourty, JC Jackson, Jonathan Jones, Julian Edelman, Miami Dolphins, New England Patriots, New York Jets, NFL, NFL news, Pat Chung, Rob Gronkowski, Stephon Gilmore, Tom Brady, Umfomba Kamalu on December 23, 2018 by Steve Balestrieri.